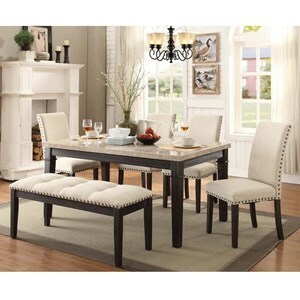 This dining set is perfect for a breakfast nook or casual dining area. The set has four chairs and a dining bench, providing room for six people to comfortably dine. The chairs have a unique curving X design on the backrest and the seats of both the chairs and the bench have black faux leather upholstery. With clean lines, square legs and a small apron, this table will fit right in with any design style. The Bannister Transitional Chair and Table with Bench by Elements International at Household Furniture in the El Paso & Horizon City, TX area. Product availability may vary. Contact us for the most current availability on this product.